Whenever I plan a dinner menu, I always try to find out if any of my guests has a favorite something that I can serve. It just makes the meal more special, I think. As I was planning the menu for a recent early Sunday afternoon dinner, I remembered that Katie had requested Cherry Cheese Tarts for dessert, but she wanted a strawberry topping instead of cherry. No problem! That's a no brainer. 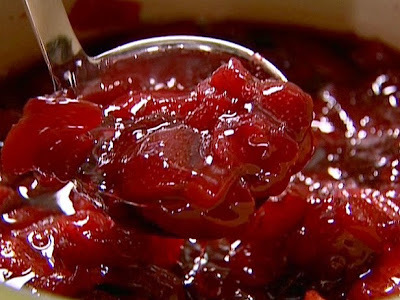 I had originally planned to use a jar of strawberry pie filling as the topping, but then I remembered seeing Ina Garten make this fabulous jam on the "breakfast party" episode of The Barefoot Contessa. After reading the DOZENS of stellar reviews under the recipe (as it's posted on FoodTV.com), I knew this was the way to go. They all raved about how easy it is to make, even for the novice cook, and it's extremely versatile too. Use it as a topping for any sort of dessert or ice cream, in a PB&J sandwich, or simply spread it on a scone or biscuit with the perfect cup of tea. Oh, and I guess it goes without saying that it tastes amazing! Fresh ripe fruit and a little orange liqueur? What's not to love? I think this is now my "go to" recipe for jam. Can't wait to try it with other kinds of fruit! Thanx, Miss Ina, for another fabulous recipe! Place the strawberries in a colander and rinse them under cold running water. Drain and hull the strawberries. Cut the larger berries in half or quarters and leave the small berries whole. Place the strawberries in a deep, heavy-bottomed pot such as heavy Dutch oven and toss them with the sugar and orange-flavored liqueur. Many of the reviews mentioned cutting the sugar by half and reported that this gave the perfect balance of sweetness. Also, several people stated that they didn't have a candy thermometer, but just cooked it for a half hour and it turned out perfectly. And those who did have a candy thermometer said their jam didn't come up to the full 220 degrees as the recipe states. When I made it, I also decided to reduce the amount of sugar from three cups down to two. I thought it tasted delicious, although I'd probably say the same thing with all three cups of sugar. I do have a candy thermometer, but it only came up to about 200 degrees. It still turned out perfectly after letting it cook for about a half hour. I didn't have superfine sugar, so I poured regular granulated sugar into the food processor with a metal blade, and processed it for a minute or so. Voila! Superfine sugar. The whole time I was making it, I kept thinking, "Am I reading this correctly? Is there really no lemon in the recipe??" This just seemed odd to me because there's always fresh lemon juice in a jam recipe. (Well, at least any recipe that I've ever tried) I thought, well, maybe the orange liqueur makes up for it. After it was all finished, I tasted it. Maybe it was because I had lemon on my mind the whole time, but honestly, I thought "this needs a squeeze of lemon juice!" So I added the juice from half a lemon. BOOM! That's exactly what I was missing! Not that I would ever second guess you, Miss Ina, but try adding a little lemon next time! Usually, when I post someone's recipe, I post my own photo. I took literally dozens of photos, trying to find just the right one, but none of them compared to Miss Ina's photo. So, I decided to borrow that too. I hope she doesn't mind! 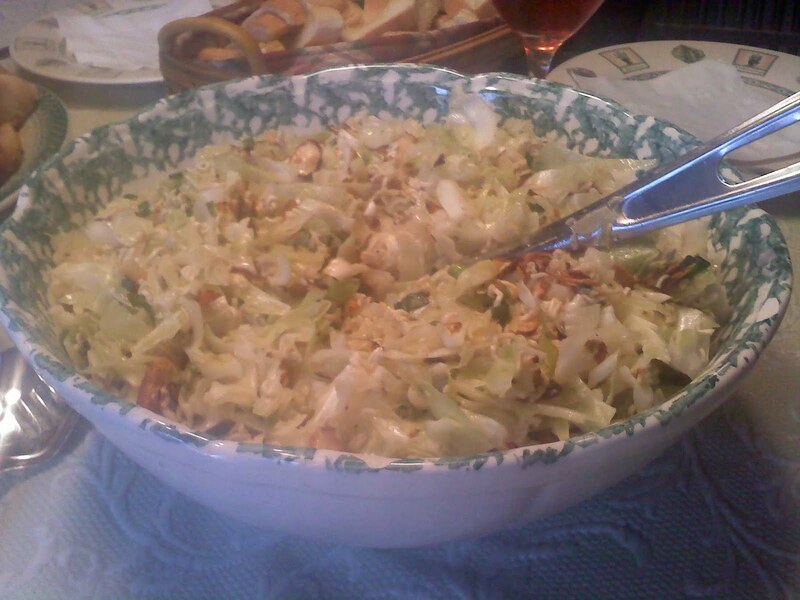 This is another fabulous recipe from our fabulous friend, Roz. As I always say, I'm not sure where she got it, but since she's the one who gave it to me, she's the one who gets the credit for it. This not your usual mayonnaise-based cole slaw. It's sweet and crunchy and sour and nutty, all at the same time. And it couldn't be simpler to just throw together! I love it! I add extra cabbage but not extra dressing. To toast almonds (or any other kind of nuts), simply place them in a heavy ungreased skillet over medium heat. Stir them constantly until they become golden brown. You can also toast them in the oven by placing them in a single layer on a baking tray and then baking them at 350F for about 10 minutes. Be very careful, though, because they can go from nothing to burnt in no time flat! Whenever I'm watching any of my favorite cooking shows, there's always one recipe that makes me want to stop what I'm doing and take a trip to the grocery store. Seriously, it's not uncommon for me to see something and immediately decide that that's what's for dinner that night. Have you ever done that? Such was the case with this recipe. 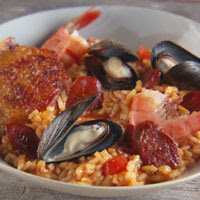 I was watching an episode of Everyday Food , and this dish looked so simple and delicious, I wanted to drop everything and go. It was clearly one of those "How can this not be good?" recipes. Not only is it extremely flavorful, but it's also really simple to make. You just keep adding things to the pan! Easy, right? Serve this the next time you want to impress someone. They'll think you're a gourmet chef! Preheat oven to 350 degrees, with rack in lowest position. In a saucepan, combine broth, saffron (if using), and paprika; bring to a simmer and keep warm. In a large oven proof skillet (at least 12 inches wide) or paella pan , heat oil over medium heat. Season chicken with salt and pepper. When oil is very hot, cook chicken, skin side down, until skin is golden, 5 to 7 minutes. Flip, spoon off all but 1 teaspoon fat from skillet, and push chicken to side. Add chorizo to skillet and cook until browned, about 3 minutes. Add onion and garlic; cook, stirring occasionally, until softened, about 5 minutes. Add tomatoes and cook, stirring frequently. Add rice; stir to coat thoroughly with tomato-chorizo mixture. Stir in hot broth and 1/2 teaspoon salt (skillet will be very full). Arrange chicken evenly on top, making sure rice is submerged. Bring to a boil and cook, stirring rice occasionally, 8 minutes. Nestle mussels in cooking liquid and cook 2 minutes more. Arrange shrimp on top. Place skillet in oven and cook until all liquid is absorbed, 10 to 12 minutes. Let paella stand 10 minutes before serving. If you're a longtime follower of my blog, you know that my friend, Trish, is not only fabulous but is also a fabulous cook. I love discussing recipes and comparing notes with her. She cooks a lot like I do (a little of this, a little of that). She often says to me something like "well, I used so and so's recipe, but I always make it THIS way instead.." I LOVE that. I think that's the beauty of cooking, don't you? You find a recipe, and then you tweak it to suit your own tastes. Fabulous! I was at Trish's house a while back, and she made this for dinner. I immediately asked her if she'd allow me to share it with everyone, and of course she agreed. There are hardly any amounts listed, because it all depends on how you like it and how much you'd like to make. It's the same method whether you're cooking 4 or 6 or 8 chicken breasts. The spices are all added to taste. 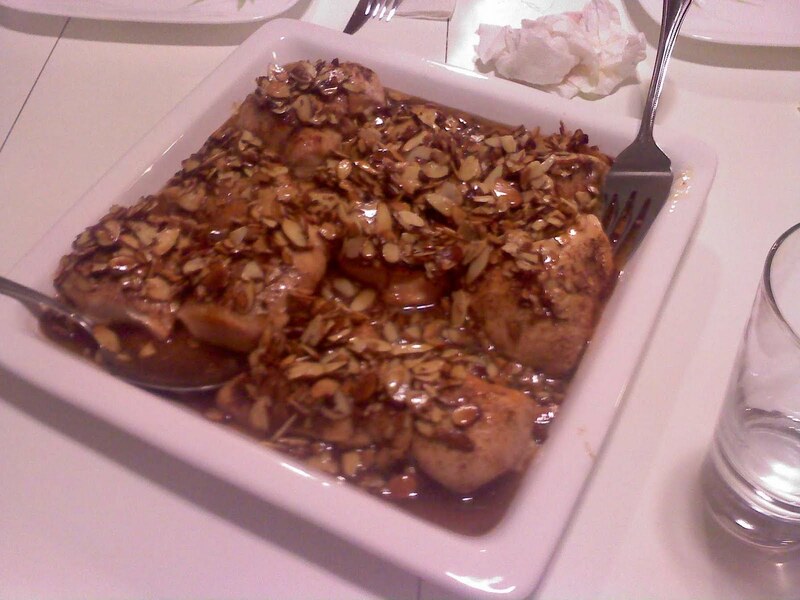 The honey and almonds are added to taste. It's like my Mom used to always say. "Do you like a lot? Add a lot." As you can see from the photo, Trish likes a lot of almonds! So tasty! Rub lemon on both sides of chicken. Place in a baking dish. In a small bowl, stir together about 3 tbs melted butter and 3 tbs honey until well combined. Brush on both sides of chicken in casserole dish. Sprinkle the spices on top to taste. Bake it for 20-25 minutes. Just before it's done, place about 3 tbs butter to a sauce pan along with the almonds and lightly saute. When they brown a little, add a little honey to taste. When the chicken is done, take it out of pan and place on a serving tray. Pour almond honey mixture on top. Serve with rice pilaf or couscous. You can use either bone-in or boneless chicken breasts. The bone-in chicken is probably tastier, but I always use the boneless breasts. As far as I'm concerned, it's the cinnamon that makes the dish, but be careful not to add too much because it might overpower everything else. I recently performed the role of Roger in a production of The Producers, and my family came to see the show. We had quite a large group! Between friends and family, I think about 35 people came to see me in the show that night. I can't even put into words how much that means to me! Since it was right around Carly's birthday, we all went back to my sister Cathy's house for coffee and cake after the show. Cathy made Gregg's Very Most Favorite Can't Resist Chocolate Chip Sour Cream Cake, and Casey made these delicious banana bars. I love anything banana, so I knew I'd LOVE them. Of course I couldn't stop eating them. SO DELISH! 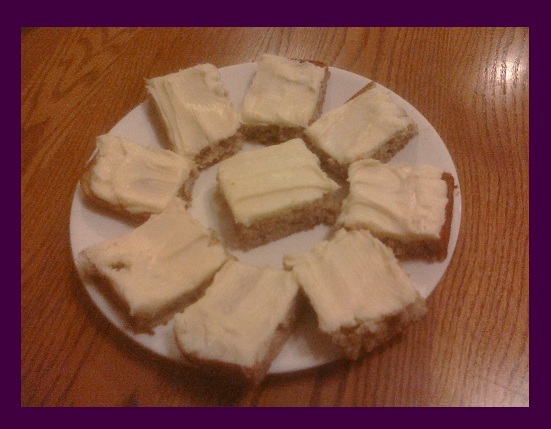 Seriously, banana bars with cream cheese icing? What's not to love? Thanx to Casey for making them, and thanx to my Jeanie for giving Casey the recipe and then passing it on to me! If you like bananas, then this one has your name all over it! Mix all ingredients together and spread in sheet pan. Bake for 20-25 minutes, or until it springs back when lightly tapped. I'd use a jelly roll pan for this one. Also, it's probably not a bad idea to grease and flour the pan, or spray it with baking spray (which is a nonstick spray with added flour, specifically for baking). Be sure that it's well chilled before you slice into bars. A, I think it tastes better when the bars are chilled, and B, I think it makes the cutting easier if the cream cheese frosting has set up a bit.